Now Do We Write Content? We’ve mapped business goal and real-world actions. Is it time to start writing content? No. Taking this route – adding content immediately after identifying behaviors – is a sure-fire way to develop a content-centric course that offers minimal engagement or practice opportunities. We brainstorm ideas with our client, SMEs, representative learners, and our own team (we might include ID, developer, perhaps graphic designer and project manager). Brainstorming generates ideas that can be quickly sketched. We sketch activities informally, sometimes using pencil and paper! We might use Google slides or PowerPoint and various shapes to represent the bare bones of the activity. Sketches need not look pretty. After we review the activity sketches with client and SMEs, we move on to create prototypes of the activities. Prototypes are functional interactions, which we usually develop using the SmartBuilder authoring tool. They may include “scratch” content. They do not look pretty. They are created rapidly, reviewed, tested, and either refined or discarded. When we invest lots of time in making a prototype look good, or pouring “real” content into it, we tend to become attached to it. This makes it harder to be open to tweaking or even scrapping the prototype if it doesn’t test well. Focus on the interaction. Is it relevant? Is it challenging? For more information on prototyping vs. storyboarding, see our previous Design Series Post #4 . Let’s look at a few examples of what we sketched and prototyped for our client. Take notes that will be helpful to the person to whom the call is escalated. In this activity, learners must take notes while listening to a recorded customer call. The notes should include anything that would trigger escalation. The learner must also research the caller’s history. Earlier iterations of this prototype allowed the learner to pause playback of the recorded call. User testing revealed that this was “bogus” – CSRs cannot pause callers in real life, as much as they may wish to do so! So, we eliminated that element of the prototype. This type of feedback is indispensable – do not skip the testing step! Also, the notes were not initially populated with any information. The learner had to listen for basic information, such as the caller’s name, while at the same time noticing anything that might be an escalation trigger. After several user tests, we learned that this basic information is displayed on the CSR’s screen. To make the activity as realistic as possible, we added the information. You can view the prototype here. You may have noticed that the second behavior was also addressed in the previous activity. That’s ok! The ratio of activities to actions can be one-to-one, one-to-many, or many-to-one. In this activity, the learner’s challenge is to ask follow-up questions to gain clarifying information. The information can be added to the notes. This activity deals with wrapping up the call. The learner must select the best two phrases that would demonstrate empathy, restate the issues, and set expectations with the caller. Remember, we use placeholder content at this stage. The more refined the content at this stage, the more our testers and reviewers become fixated on wording and grammar, when we need them to focus on functionality. The real content that we will later elicit for our first complete build will include the two correct answers, as well as three or four plausible, but incorrect, “distractor” phrases. At the end of the activity, the learner is again given the chance to add to their notes before moving on. 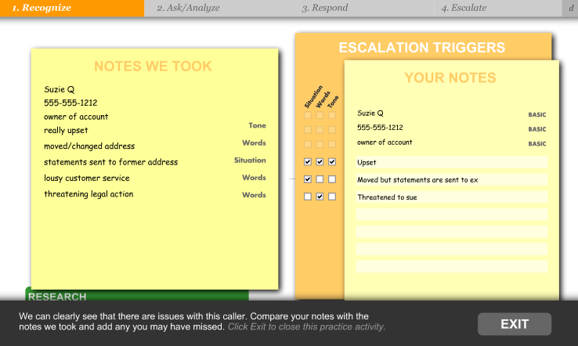 This activity provides the learner the opportunity to practice writing a summary before escalating the call. The summary must follow the guidelines of CARP – Complete, Accurate, Relevant, and Professional. The learner can compare their summary with a model summary to see if they’ve included appropriate information and kept the tome professional. Of course, the design and development process doesn’t end with prototyping, but our Design Challenge Series 2 does. Have an idea for another Design Challenge? Get in touch. We’re interested in your thoughts on prototyping. How do you use prototypes in your work? Do you have concerns about trying prototyping? What other ideas do you have for activities to help learners practice the behaviors we discussed here? Post your feedback and ideas in the comments section below. Great activities! They make the student practice the stuff they need to do on the job in a realistic way. I found it a bit difficult to classify some of the notes as situation or words or tone, but it did make me think about those aspects.